The C-suite may be filled with the most powerful and influential executives in a company, yet according to a recent poll, only half of them realize the power and influence of social media. Many CEOs, CFOs, and CMOs have yet to see the value of social media and they’re missing out on valuable opportunities to connect with consumers and benefit the business. The C-suite regularly expresses concerns over brand image control, fear of feedback, regulatory restrictions, lack of experience, and ROI. But now that that social media marketing has become a multi-billion dollar industry employed by millions of companies worldwide, it may be easier for the C-suite to see how social media can contribute to the company’s image, success, and bottom line. To help change the mindset of executive minds, TheGuardian.com offered these top tips. Show and Sell Social Media – Many corporate executives are rather conservative and are skeptical of the unknown. Social media may be new to them, so rather than talk about it, help to get them on it. Encourage them to visit competitors’ pages and view the engagement between consumers and brands. Let them witness how brands are promoting their products, gaining exposure, building relationships, and generating sales with every social comment. Show them how brands have community managers who oversee the course of conversations and maintain control of the brand image. This will demonstrate how social media is enabling brands to both maximize and maintain control of their image while providing them with a competitive edge in the minds of consumers. Seeing social media in action should help reduce their concerns about the format. And knowing that competitors are rapidly gaining market share by engaging with their market should increase their desire to get in on the social media scene. Connect Corporate Values to Social Media Value – Executives think in terms of goals, image, and revenue, so speak their language when talking about social media. It’s important to realize that many members of the C-suite haven’t embraced social media because they don’t understand how they can measure their return on investment and translate social posts into sales performance. The only way to halt their hesitation is by showing them the direct link between corporate aims and social media claims. 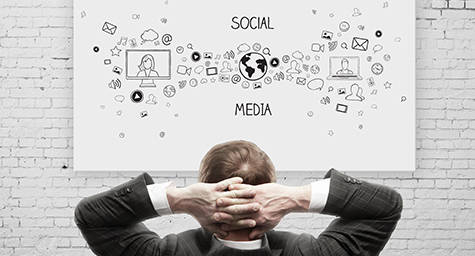 Express how a social media presence can help them achieve their objectives beyond marketing. Explain how social feedback provides a direct line of communication between the company and consumers that can help the business improve its products and operations. Describe how social media contributes to market share and steady sales by developing consumer relationships that lead to long-term loyalty. By showing how social supports corporate goals, this should diffuse any doubts and show how social media is good for business. Position Social Media as an Investment, Not an Expense – The C-suite’s job is to focus on return, results, and revenue. One common reason why many avoid social media is because they see it as additional outlay of resources instead of an opportunity for returns. That’s why it’s important to emphasize how spending on social media can actually save a company money, time, effort, and resources. Explain how devoting a small team to social media can eliminate the need and expense of a large customer service center because community managers can be specially trained to handle customer issues online instead of on the phone. Illustrate how sharing new products and promotions on social media can cost a lot less than a large-scale ad campaign and ultimately achieve greater reach and exposure. Relay how consumers tend to have a better image and higher preference for companies that interact with them personally, which leads to direct sales and brand advocacy. By highlighting all of these benefits, the C-suite can see how social media is not just another company expense, but an investment in better business. Discover how social media can help you meet your marketing goals. Contact MDG Advertising today at 561-338-7797 or visit mdgadvertising.com.